Hiring an arborist is a decision that should not be taken lightly. Proper tree care is an investment, which can lead to substantial returns. Well cared for trees are attractive and can add considerable value to your property. Poorly maintained trees can be a significant liability. Pruning or removing trees, especially large trees, can be dangerous work. 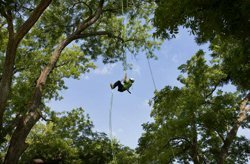 Tree work should only be done by those trained and equipped to work safely in trees. "This we know: the earth does not belong to man, man belongs to the earth. All things are connected like the blood that unites us all. Man did not weave the web of life, he is merely a strand in it. Whatever he does to the web, he does to himself..."